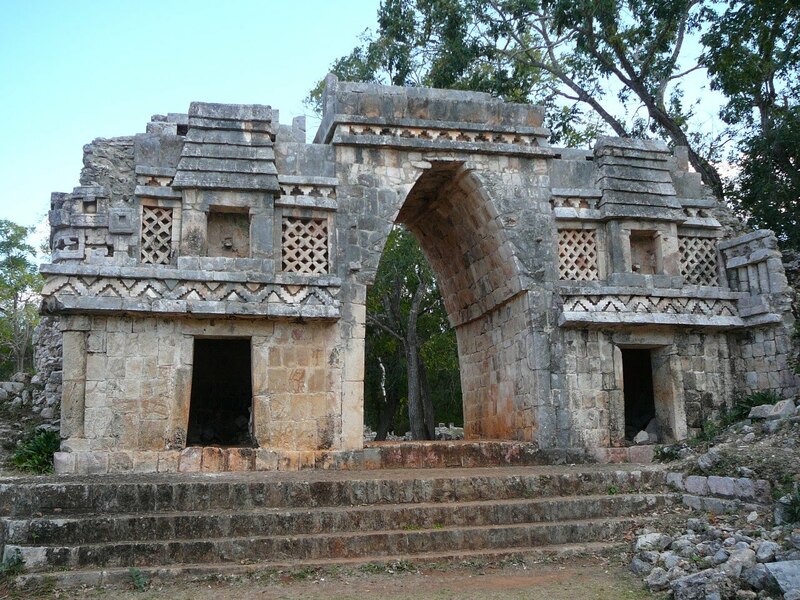 From Uxmal we take a circular route back to Merida in order to see other Mayan ruins. But our first stop is at a village called Santa Elena where we are told there is an interesting Museum housing several mummified bodies that were found under the church floor. The museum consists of three small rooms with hardly anything in them other than four tiny bodies of children in open coffins, shown beneath a large sheet of extremely dirty glass. At the entrance are three local young women who presumably are there to take the entrance fee of ten pesos. But they are so excited to see a foreign tourist that all they can do is giggle and blush. We try to talk to them, but they just turn an even brighter shade of red and giggle some more. The museum itself is so depressing that the giggling girls are a welcome relief. From there we go on to Sayil, where the Palace of the Ants is found. It is a huge Palace of 90 bedrooms, but little has been restored and you are not allowed to go in or on it. Consequently very few tourists come here. In fact we are asked to sign a guest book which shows that the last visitors came three days ago. 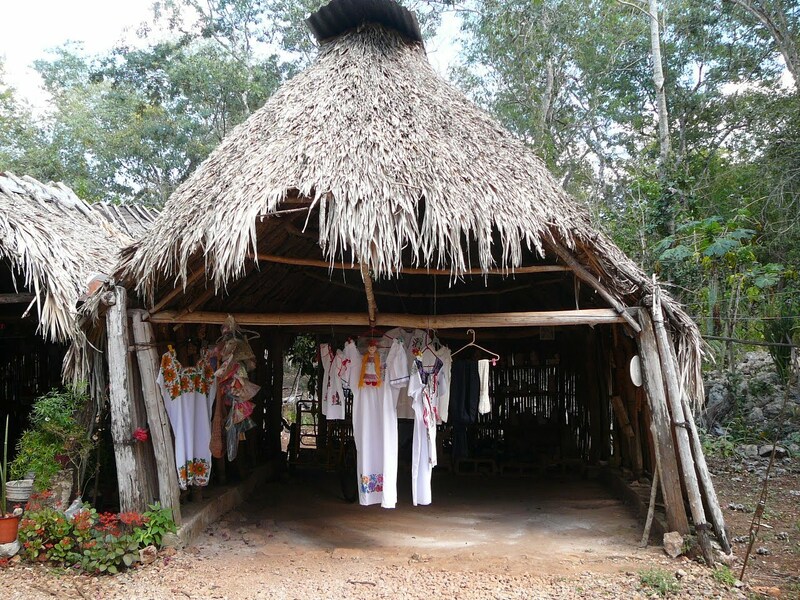 The site actually boasts a gift shop, which is a truly desultory affair, the entire stock consisting of about seven rather dirty white dresses on coat hangers, hanging from an open sided Palapa. Maybe the last guests were major shoppers and bought up everything else. Our next stop is Xlapak, which even the tour book describes as “a site of some fourteen mounds”, which makes it sound so unimpressive that they couldn’t even be bothered to make an exact count of the mounds. We drive on by. The next site is much more impressive. Labna used to be a Mayan city of over 2000 people. It is a large site with three partially restored buildings. Again the setting is lovely with raised streets crossing huge lawns. This site is famous for The Arch of Labna, a beautiful arch that once marked the entry to a nobleman’s house. Labna is lovely, and we are amazed that there are only two other people here. They are a very elegant pair of Mexican women carrying huge sun umbrellas and strolling across the lawns as if they were at some garden party. 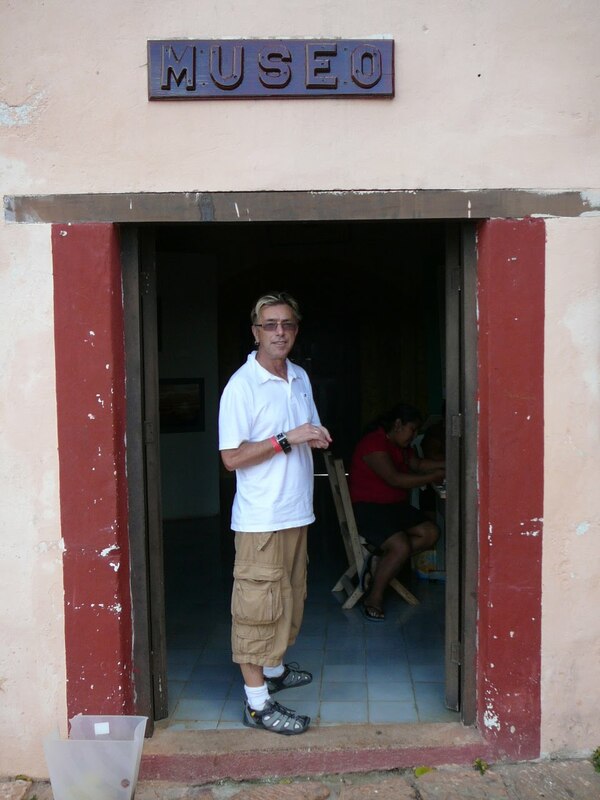 This entry was posted in Labna, Mayan Ruins, Merida, Mexico, Santa Elena, Sayil, travel, travel review, travelogue, Uxmal, Xlapak. Bookmark the permalink.